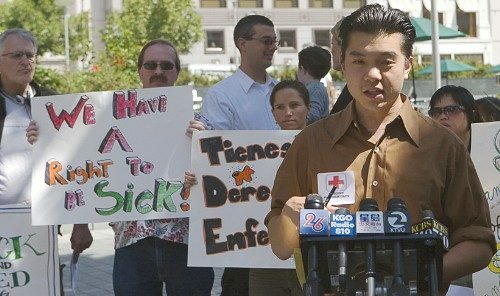 Voters will decide in November whether to mandate employer paid sick days for all employees in San Francisco. 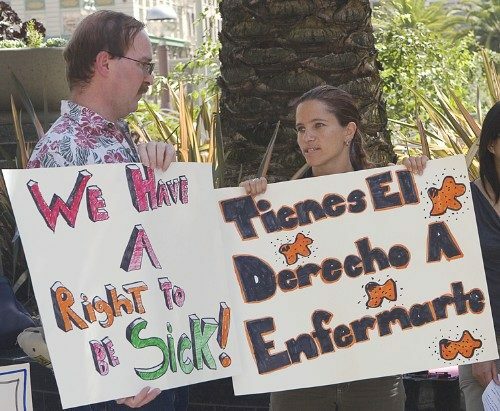 If approved by voters, San Francisco would become the first city in the nation to require paid sick days, according to a group calling itself the Coalition for Paid Sick Days. Representatives of the group accompanied four members of the San Francisco Board of Supervisors yesterday to file the ballot proposal with the Elections Department. They include Supervisors Tom Ammiano, Chris Daly, Sophie Maxwell, and Ross Mirkarimi. Both Ammiano and Daly appeared in an 11:00 a.m. Union Square press conference as coalition members called for measure passage. Garment industry workers are now afraid to get sick, reported Alex Tom, a spokesman for the Chinese Progressive Association. “This is a huge issue,” stated Tom. The Chinese Progressive Association’s Alex Tom recalls a restaurant worker hiding in the bathroom to take medicine. “We represent garment workers and restaurant workers of the working class Chinese community. Tom recalled one worker hiding her need for medication from an employer. “This worker was so afraid of being fired for being sick that she was in the bathroom taking her medicine,” stated Tom. Diners are impacted by being served from sick restaurant workers, he added. “There are actually a lot of people who work while they are sick. According to the coalition, the ballot measure would provide paid sick days for workers to care also for parents and legal guardians, siblings, children, spouse or registered domestic partners, grandparents, and one designated person not included in those categories. Categories refer to biological, adopted, and foster family relationships, according to the coalition. — Every worker in San Francisco shall accrue one hour of paid sick leave for every 30 hours workers. — New workers shall start accruing sick leave after a three month probation period. — Sick day accrual has a cap of nine days or 72 hours for businesses with more than 10 employees. — Sick day accrual has a cap of five days or 40 hours for small businesses, defined as ten or under employees. — Employees may use sick hours to miss part of a shift to attend medical appointments. — In the case of a union contract the legislation has a collective bargaining op-out. — Accrued leave may carry over from year to year but employers are not required to provide more than 72 hours (or 40 hours for small businesses) to workers. — Workers may not cash-out or be reimbursed for unused hours upon the termination or resignation of employment. — The law goes into effect 90 days after election certification. — Employers are not required to provide additional sick leave or modify existing leave policies if a sick leave policy is already in place which meet ballot measure requirements.